“When a single proton (p) is smashed against a lead ion (Pb), unexpected events may occur: in the most violent p-Pb collisions, correlations of particles exhibit similar features as in lead-lead collisions where quark-gluon plasma is formed. This and other amazing results were presented by the ALICE experiment at the SQM2013 conference held in Birmingham from 21 to 27 July. Event display from the proton-lead run, in January 2013. This event was generated by the High Level Trigger (HLT) of the ALICE experiment. 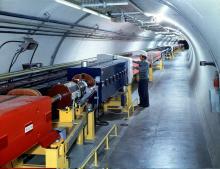 “The ALICE experiment at CERN specializes in heavy-ion collisions at the LHC, which can produce thousands of particles. In analysing this maelstrom, the researchers need to know exactly how material is distributed in the detector – and it turns out that the LHC’s simpler proton–proton collisions can help. THERE IS A TON OF UNEXPLAINED JARGON IN THIS ARTICLE. IT IS REALLY WRITTEN EXPECTING SPECIALISTS TO BE THE READERS. BUT I OFFER IT FOR ANYONE WHO MIGHT KNOW WHAT IS GOING ON OR WHO MIGHT WISH A STARTING POINT TO DIG IN AND FIND OUT. “20 years ago ALICE started its amazing adventure in the wonderland of strong interactions and the study of extraordinary forms of matter like the Quark Gluon Plasma. CERN’s ion programme has a long history and was initiated in 1986 with the acceleration of oxygen ions at 60 and 200 GeV/nucleon, and continued with sulphur ions at 200 GeV/nucleon up to 1993. 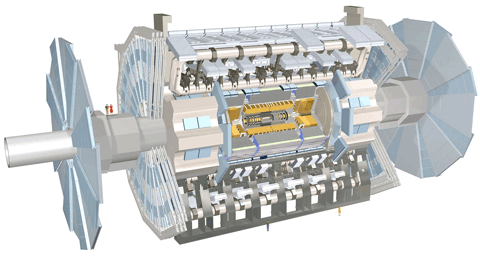 The first Lead-ion beams at 160 GeV/nucleon became available in 1994. The accelerating chain for 16O and 32S consisted of an ion source of the electron–cyclotron resonance (ECR) type, a radio-frequency quadrupole (RFQ) pre-accelerator, the linear accelerator injector (LINAC I), the PSBooster , the PSand the SPS. For the acceleration of lead ions, a new ECR source, a new RFQ and a new LINAC had to be constructed. The results of the light-ion programme strongly supported its continuation with heavier-ion beams. In particular, the energy densities reached during the collisions appeared to be high enough to be interesting, and many of the suggested signatures for the onset of a quark–gluon plasma phase turned out to be experimentally accessible. The experience gained was instrumental in assessing the feasibility of experiments with lead ions and for indicating the necessary detector modifications. Seven experiments participated in the lead-age adventure. Following the previous successes of the heavy-ion physics programme at CERN the idea of a heavy-ion dedicated experiment that would study lead-lead collisions at the new energy scale of the LHC was discussed. During the previous years, the experience gained was instrumental in assessing the feasibility of experiments with lead ions and for indicating the necessary detector modifications that were needed to move with the lead-age adventure at the new scale of the LHC. The first appearance of ALICE was in the Evian meeting back in 1992. Jurgen Schukraft recalls that: “We had to do enormous extrapolations because the LHC was a factor of 300 higher in centre-of-mass energy and a factor of 7 in beam mass compared with the light-ion programme, which started in 1986 at both the CERN SPS and the Brookhaven AGS.” A Letter of Intent for a new experiment at the LHC was submitted on 1 March 1993 to the LHC Committee that was formed shortly after the Evian meeting. It marks the first official use of the name ALICE and it was signed by 230 people coming from 42 institutes around the world. It was clearly describing the proposal of the ALICE Collaboration for building a dedicated heavy-ion detector to exploit the unique physics potential of nucleus-nucleus interaction at LHC energies and where the formation of a new phase of matter, the quark gluon plasma is expected. The submission of the letter of intent was followed by a detailed technical proposal that was submitted two years later in 1995 and shortly endorsed by the LHCC and the CERN management. ALICE studies strong interactions by using particles – created inside the hot volume of the Quark Gluon Plasma as it expands and cools down – that live long enough to reach the sensitive detector layers located around the interaction region. The physics programme at ALICE relies on being able to identify all of them – i.e. to determine if they are electrons, photons, pions, etc – and to determine their charge. This involves making the most of the different ways that particles interact with matter. Over twenty years, ALICE has developed a wide range of R&D activities, confronted many challenges in designing and building new detectors that could cope with the physical challenges at the new energy scales. One should also refer to the big data challenge as heavy-ion collisions produce petabytes of data that need to be stored and later analysed in order to get new physics results. Following the first run, ALICE successfully reported on the formation of QGP and offered a new insight on the nature of strong interacting matter at extreme densities. The existence of such a phase and its properties are a key issue in QCD for the understanding of confinement and of chiral-symmetry restoration. Wherever you look, from the energy loss of fast quarks to quarkonia, from the details of the dynamical evolution of the system to the very first study of charmed hadrons and the loss of energy, the interplay between , to name just a few, the ALICE results stand out for their quality and relevance. Following the recent proton-lead run that opens new horizons for the heavy-ion community at CERN, ALICE is now looking forward to a series of upgrades during the LS1. 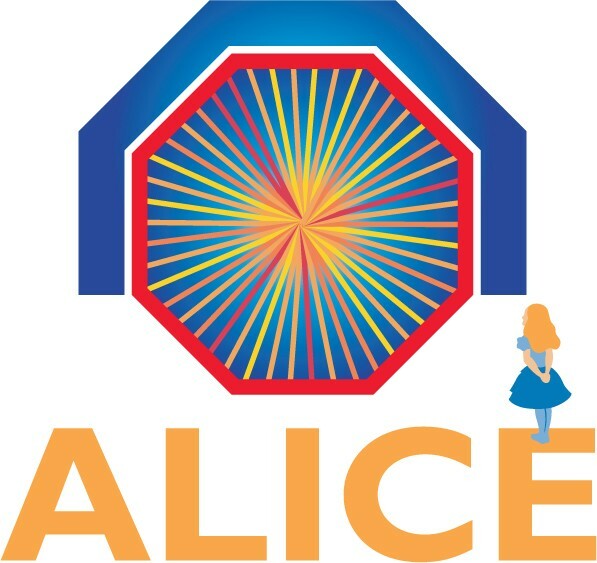 From CERN ALICE: "How ALICE was born’"
“In 1982 a MoU was signed by GSI, Darmstadt, CERN and LBL Berkeley to get heavy ions to CERN: GSI promised to bring an ECR-ion source and LBL a RFQ Linac to the CERN site. Rudolf Bock(GSI), Herrmann Grunder (LBL) and Reinhard Stock (Uni Marburg) and others proposed to have heavy ions in the CERN PS. Robert Klapisch, then research director of CERN, found SPS more adequate and this lead to heavy ion physic[s] with Oxygen beams in 1986, sulphur beams in 1987 and lead beams in 1994. A few years later, a proposal for a heavy-ion programme was submitted in the LHC project . Rubia, kept his promise and among many things he insisted on a two-in-one magnet solution for the LHC instead of a pp_bar mode with only one vacuum chamber (what’s the benefits of this architecture? One vacuum chamber and one magnet is only good for ppbar, an option several persons preferred since it was also cheaper ). And, so it goes in HEP. Read the full article here. Next year, scientific collaborations will take full advantage of the Large Hadron Collider’s time without beam. “The Large Hadron Collider will go into a long shutdown early next year to allow scientists and technicians to prepare it for higher collision energy in 2015. It has been running at 7 TeV; scientists plan for it to reemerge at upward of 13 TeV. Beginning in February of 2013, highly coordinated teams will spend 20 months preparing its equipment for the change. Higher luminosity means more particle collisions, and the experiments will need more advanced equipment to keep up. With the detectors the most accessible they have been since their original construction, the four big LHC experiments will take the opportunity to perform upgrades and routine repairs. The collaborations already have plans for the new year. The ALICE experiment focuses on collisions of heavy ions to study the conditions present just after the big bang. The collisions produce a quark-gluon plasma, a hot soup in which quarks travel freely instead of being bound into particles. They also produce high-energy quarks and gluons that interact with the plasma and then fragment into jets of particles and gamma rays. ALICE will install a new part to a system that records the energy of particles. The new Di-Jet Calorimeter will broaden the experiment’s ability to measure the energy of individual gamma rays. Scientists can study an individual gamma ray to infer the energy of the quark from which it was emitted. That way, they can study how the quark-gluon plasma affects the energy of the quark and resulting jet of particles. ATLAS will add a fourth layer of pixels, known as the Insertable B-Layer, to its pixel detector. The increased number of pixels will enable measurements at a location closer to where particle collisions occur and allow scientists more accurately to identify jets of particles produced from bottom quarks. Identifying these particles is important in the search for the Higgs boson, which, according to the Standard Model, frequently decays into bottom quarks. 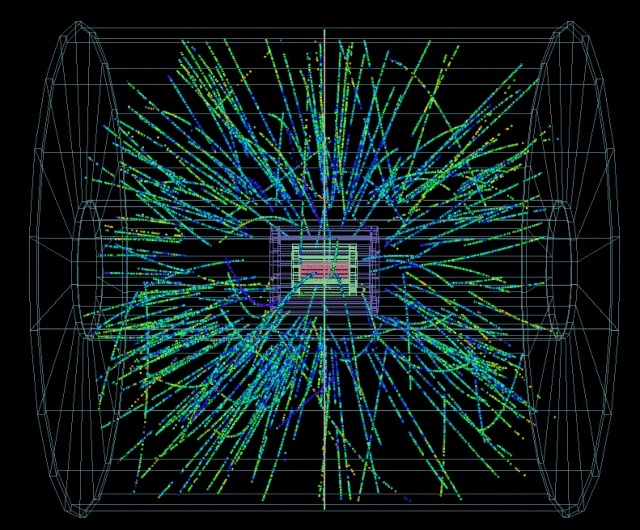 The ATLAS and CMS experiments discovered a Higgs-like particle this summer. The LHC experiments cannot record data from every single collision that occurs, so they select or discard this information at a split second’s notice using automatic triggers. At higher luminosity, the experiments will deal with more collisions and therefore will need better trigger systems. During the long shutdown, the CMS experiment plans to add a new layer to their muon detector, which will help them to decide which collisions are worth studying. LHCb’s most important project during the shutdown will be to replace a segment of beam pipe and its support structures. The new pipe will be able to withstand temperature changes and radiation better, and the lighter support structure will reduce background in the detector. LHCb will also begin to prepare for the next planned shutdown, in 2018, when they will install an upgrade to their detector. “Scientists on the ALICE experiment just completed the installation of a crucial component for tracking high-energy particle jets. Without it, physicists would be lacking critical tools to select which events out of billions to store and analyse. Engineers and physicists around the world worked intensively over five years to complete the electromagnetic calorimeter, or EMCal. The United States, supported by the Department of Energy’s Nuclear Physics Office, contributed 70% of the project costs. Scientists installed the last two pieces of the 80-ton device on January 18th. 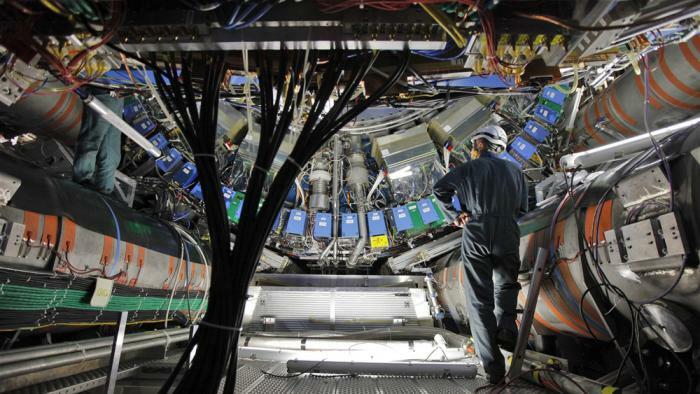 The ALICE detector’s calorimeter was specifically designed to study the most complex collisions at the Large Hadron Collider (LHC), those created using beams of heavy ions. These collisions recreate Big-Bang-like conditions and produce events with many more particles than the LHC’s usual collisions using beams of protons. CERN typically smashes lead ions together each November. These collisions produce a gloopy mixture, known as the quark-gluon plasma (QGP), in the centre of ALICE. Occasionally, a very energetic quark or gluon, called a jet, will also be created in the collision. When this happens, the QGP gets in its way, and that interaction is important for researchers seeking to understand material which first existed in the earliest moments of the universe. The EMCal allows ALICE to select and record the rare events containing such jets, and to measure their properties precisely. 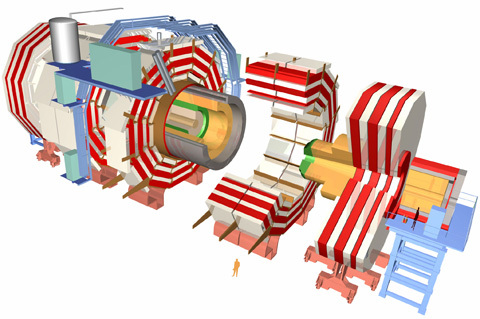 A second arm of the EMCal will be added to ALICE during the long LHC shutdown in 2013. “Scientists on the ALICE experiment at the Large Hadron Collider just completed the installation of a crucial component for tracking high-energy particle jets. Without it, physicists would be lacking crucial tools to select which events out of billions to store and analyze. Engineers and physicists around the world worked intensively over five years to complete the electromagnetic calorimeter, or EMCal. The United States, supported by the Department of Energy’s Nuclear Physics Office, contributed 70 percent of the project costs. Scientists installed the last two pieces of the 80-ton device on Jan. 18. From Quantum Diaries: Paul Gagnon on Why the LHC? “There are bosos and bosons, and if the Large Hadron Collider (LHC) were built only to find the Higgs boson, you would be absolutely right to think all physicists belong to the first category. But the fact is, the LHC does much more than search for Higgs bosons. Despite the media focusing mainly on the Higgs boson, this search only represents one of the many aspects we hope to cover with the LHC. Granted, the Higgs boson brings such an elegant solution to the problem of the origin of mass that its high popularity among physicists has reached even the general public. Paul is a good writer. Please visit his post. He points to dark matter, asymmetry, the various experiments at CERN, ATLAS, ALICE, CMS, LHCb. He points to galaxy movement. This is a nice overview piece.Check it out.